Hate speech has no place on the Internet, Facebook says, and this week it put at least some of its money where its mouth is. Specifically, the social network on Monday helped launch the Online Civil Courage Initiative, a new, million-euro effort designed to stamp out hate speech and extremism on the Internet in Europe. The new effort aims to support European nonprofit groups involved in the fight against online extremism, which has been reaching new heights amid the refugee crisis afflicting the region. The initiative will also bring together experts to jointly develop a set of tools and best practices to further that goal. 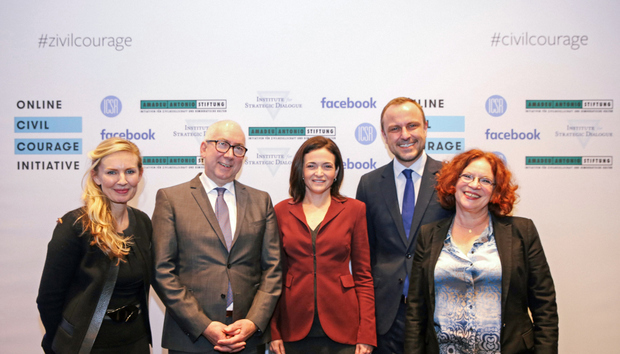 Headquartered in Berlin, it was jointly organized by Facebook COO Sheryl Sandberg along with the International Centre for the Study of Radicalization and Political Violence, the Institute for Strategic Dialogue and the Amadeu Antonio Foundation. What proportion of the effort's stated one million euros comes from Facebook itself wasn't clear, and the company didn't respond to a request for clarification. Hate speech online has been a particular focus in Germany as it struggles to cope with the unprecedented influx of refugees arriving at its borders. In December, Facebook, Google and Twitter agreed to combat online racism by deleting hate speech from their websites within 24 hours. "In the past year, we've seen millions of people come together online to support refugees and stand in solidarity with the victims of terror attacks," Sandberg wrote in a post on her Facebook page on Monday. "But we’ve also heard voices of hate growing louder. With extremism damaging lives and societies across the world, challenging those voices has never been more important." Deleting content "won't make the hatred go away," Sandberg added. "We need the voices of tolerance and love to ring out across the world, because the best remedy to bad speech is more speech." It remains to be seen, however, how well Facebook puts those values into practice. "Enforcement has been an ongoing issue with Facebook in the past," noted social media strategist Lon Safko. "I hope Facebook stands behind their own policies, even at the cost of some members' 'freedom of speech' rights."